References are made wherever possible. All statements are based on the author’s experiences. I take pride in informing the public and helping as many as I can through sharing my experiences with my readers. That said, no one except you can take responsibility for your investment decisions, so do think it through before investing. If you are looking for more detail on how cryptocurrencies actually work, take our course on it. With the current merciless run of the bull market, it is only a matter of time before your crypto holdings surge in value. When it does, like it or not, crypto will unavoidably receive much-unsolicited interest from hackers. To not repeat the tragic Mt. Gox incident, holders are removing cryptocurrency from the exchange and decentralizing their storage. The question of why you should purchase a wallet becomes the more pertinent question of which wallet should a cryptocurrency investor use. As do all forms of insurance, security comes at the cost of money and convenience. How should we balance it in a way that suits our risk profile? 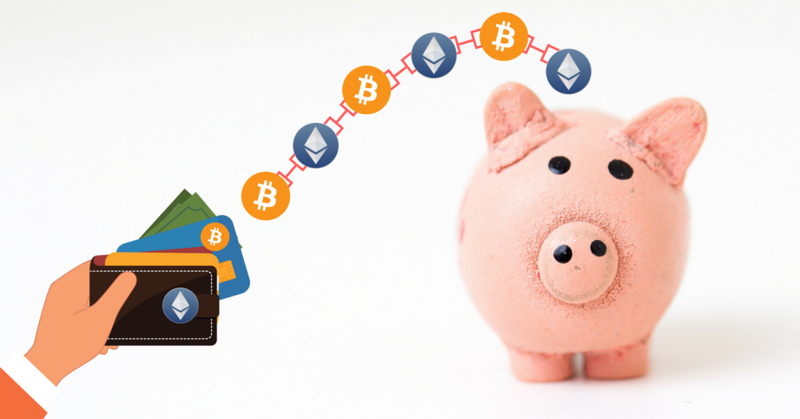 In this post, I will summarize the unique features of the top 7 cryptocurrency wallets that an experienced holder must know of. Cost. Is it free? What are the drawbacks of using this wallet? Security. Does the company have a track record of security excellence? Mobility. Is it easy to keep and difficult to lose? Is it accessible anytime, anywhere? User-friendliness. Is the wallet UI intuitively designed? Can I store a range of altcoins? Convenience. Am I able to make a fast purchase when the time calls for it? Style. Do I have a weakness for cool tech gadgets? You may want a wallet that offers the best combination of the above-mentioned traits. Remember, all wallets have their edges and shortcomings. Apart from the intuitive UI, Atomic Wallet has offers a wide range of features, such as decentralized storage for private keys, a built-in option to buy crypto with a bank card, Atomic Swaps, instant exchange via Changelly or Shapeshift and an interface for custom tokens. What makes Atomic Wallet so unique is the support of Atomic Swaps, a relatively new decentralized exchange technology based on hash timelock contracts. Currently, this feature is available for Bitcoin, Litecoin and QTUM. In the nearest future, Atomic Wallet plans to make Ethereum available for the swaps, as well. The coolest looking tech gadget to show off to your friends. Made by a relatively new company, KeepKey offers a hardware wallet of a polished design. KeepKey is said to be a port of Trezor’s code and firmware, so their main difference is the material. KeepKey feels like a ‘premium’ wallet but might be a little on the heavy side and hence more susceptible to drops. It comes with a standard, simple to use client UI. Nano Ledger S is just as secure as the other two hardware wallets. It is popular because of its relatively low price of $65 compared to its competitors. Being smaller than KeepKey, it is more portable and easier to carry around. It is a hardware wallet that comes at a very competitive price. 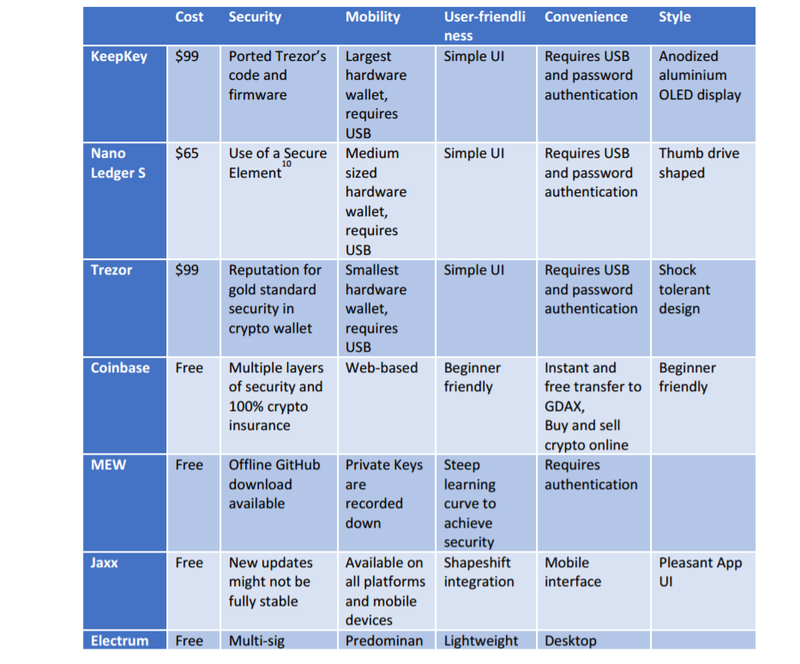 Trezor is one of the first movers in the hardware wallet industry and sets the gold standard for crypto security. Trezor has a reputation for providing top-notch security, protecting against both virtual and physical theft. What Trezor lacks in style, it more than makes up in the security department. Even if your PC is compromised with malware, your private keys will still be safe with Trezor. In this sense, Trezor is more of a vault than a wallet. Coinbase is an online web-based wallet and is the beginner-friendly version of GDAX. As a hot wallet, you can easily transfer to the GDAX exchange instantly, and for free. In the same interface, you can make quick purchases with fiat. What’s more, 100% of your crypto holdings on Coinbase is insured. You can activate 2-Step Verification and Google Authenticator for more protection, and Coinbase even has a vault available if you wish to trade convenience for an added layer of security. The only drawback is that Coinbase only offers Bitcoin and Ethereum wallets. Paper wallets are for those who wish to have their own private wallets without forking out cash for hardware wallets. The money saved could be invested in their coins. Simply generate your wallet online at myetherwallet.com and note your private keys. The website does not store or transmit any of your private information. If you don’t trust the online version, you can even download it from GitHub and run it offline. Paper wallets are free but require an in-depth knowledge to set it up properly. In short, this type of wallets generally take a lot of hassle and are not advised for novices. Carrying your crypto around safely and conveniently is no longer a distant dream. Behold Jaxx, the world’s first mobile wallet solution. Versions for iOS, Android, desktop and browser are now available. Jaxx uses a mnemonic seed to back up your wallet or transfer it to a different device. Jaxx allows you to receive your funds, scan QR code, view your crypto holdings, all in one intuitive app. Advanced features such as shapeshift integration and multiple platforms wallet linkage makes this the preferred wallet for the tech savvy. The only drawback with this wallet is that it might have a steep learning curve, and features might not be stable with all the new integrations. With time, this will prove to be a promising solution. Electrum is a fast, lightweight wallet for desktop and mobile users. It has a long list of supported features to make it the most flexible wallet today. It offers cold storage solutions, integration with hardware wallets (KeepKey, Nano Ledger S, Trezor) and able to achieve anonymity (with Tor). On the security side, Electrum enables multi-sig support, and it is not tied to a centralized server, so server downtime will not be an issue. Overall, Electrum is the established software wallet solution out there that warrants a try-out. Give Me a Comparison Chart Please! An all-in-one package wallet does not exist. It is important that you manage to find the wallet that addresses your greatest concern, be it security from theft, ease of transfer, convenience, monetary cost, or even style. A wallet may turn out to be your greatest investment decision, financial wise and emotional health wise. Should Blockchain Learn to Handle Our Mistakes? Why are Smart Contract Security Audits So Important?